I was recently asked by a colleague to create an advertisement for their consulting business, for use in an quarter page ad in a conference program. I'm proud of how it turned out, so I'm sharing the first draft of the ad below. If you want to see the final version of the ad, you'll have to attend the conference in Hawaii! 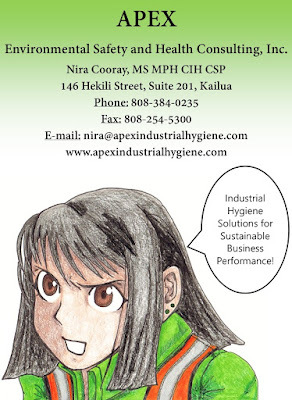 Ad for Apex Environmental Safety and Health Consulting, Inc.
Apex Environmental Safety and Health Consulting is a sponsor for the 14th Biennial Governor's Pacific Rim Safety and Health Conference (2016) in Waikiki from May 2 to 4, 2016. My colleague, Nira Cooray, is presenting on "Measurement of Noise: Tricks & Tips for the Safety Professional." The conference's theme is "E Ho 'o Lokahi I Ke Ola Mau" ("Coming Together to Preserve Life Forever"). The conference is hosted by the American Society of Safety Engineers (ASSE) Hawaii Chapter. Mahalo to Apex for asking me to draw this spunky ad!